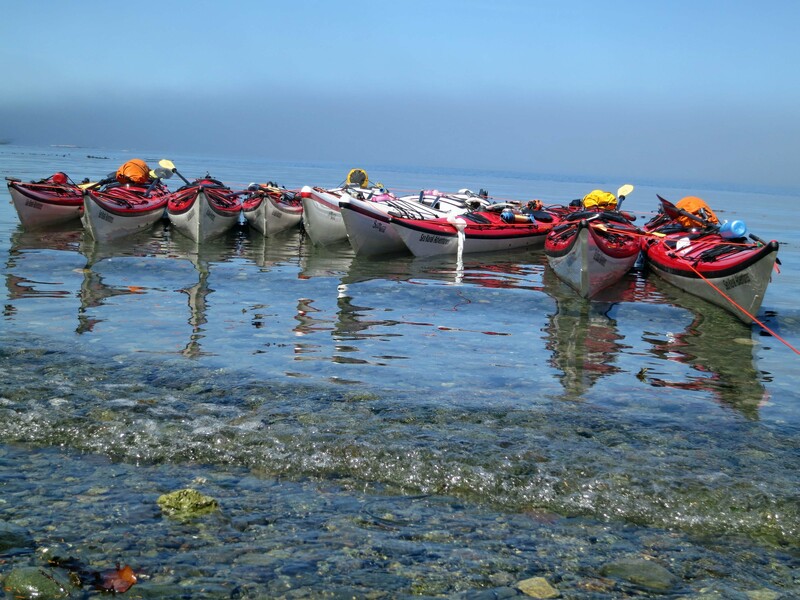 Our sea Kayaks wait patiently for us as we have lunch in a cove off of Johnstone Strait where we spent seven days out sea kayaking among orca whales. Five years of blogging on WordPress have taught me that most of my posts fall under the broad category of travel and adventure travel. 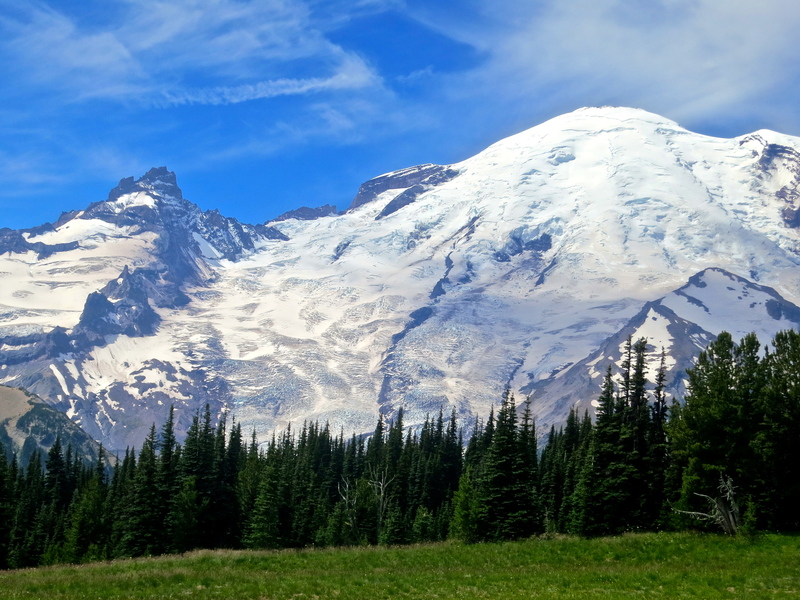 Looking up at Emmons Glacier from the Sunrise Visitor’s Center at Mt. Rainier. Skim my archives to join me on past adventures. One blog finds my wife Peggy and I chugging up the Amazon and eating piranhas while another finds us lost in a raging dust storm at Burning Man in the Nevada Desert. There are blogs on national parks, totem poles, Big Horn Sheep and amorous burros. Learn what it is like to explore East Africa’s big game parks in a Volkswagen Beetle, negotiate the narrow waterways of Northern England in a 60-foot canal boat, and wake up with a bear standing on top of you in the Sierra-Nevada Mountains of California. Morning sun catching the copper face of the temple provided the rich color here of the 2015 Temple at Burning Man. 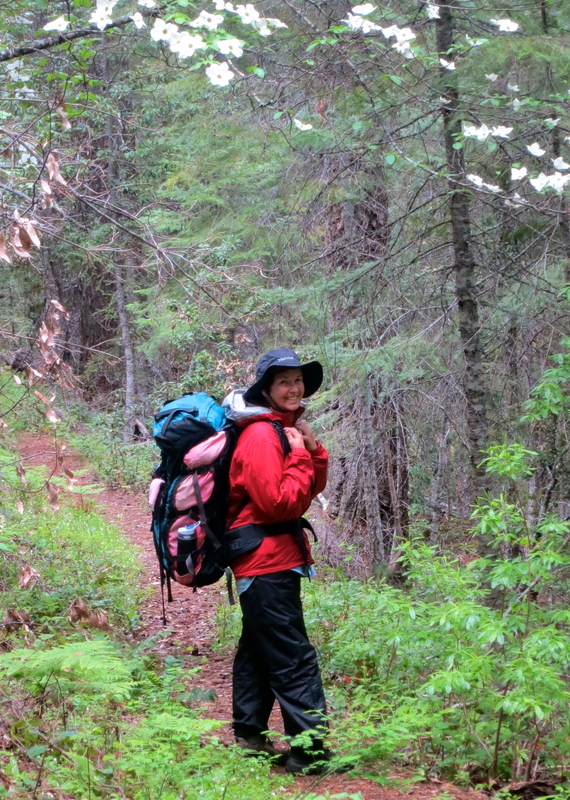 One of our trips this past year was backpacking into the rarely travelled Red Butte Wilderness of Southern Oregon, reputed to be prime Big Foot country. Peggy stopped here under a flowering dogwood. Who knows where the winds will blow us this year, but we would love to have you along for the adventure. It would be fun to gather suggested activities for Bone’s next adventure. Maybe you can create another spot on the blog for the suggestions. Great idea Tasha… I’ll get on it right after Burning Man. While on one of my adventures into the wilderness, in the mountains of North Carolina, I happened upon an itinerant idler by the name of Marshall. I enjoyed chatting with him, and found his stories of travel rather entertaining and informative. I was fortunate enough to run into him again two years later. He gave me this website, I believe as a way to keep in touch. I plan to travel more, as opportunity arises, and would like to cross paths again. With any luck, this site can help facilitate that. Marc… good to hear from you. The Itinerant Idler is a wanderer of epic proportions as he migrates with the seasons. My brother Marshall and I were born to roam the world, coming from a long line of travelers who first hit the shores of North America from England in the 1630s and began to head west. From time to time I catch up with the Itinerant Idler and the modern day Gypsies that make up his world, people who happily disappear off the radar. I will blog about them from time to time when our paths cross. Hi Curt… My husband Jake and I had the good fortune of meeting your brother Marshall in Southern Florida this week. He was a fountain of information for us regarding free camping spots as we go north and shared several good stories about his life, including the story you wrote about almost scaring your sister to death. I plan on enjoying your blog as we go along (we are on a year-long adventure)…you are an excellent writer. The RPCV in me really appreciates the memoirs of PC life. Cheers! Greetings Laurel, First up, I jumped on your website. Looks like you and Jake share our love of travel and photography. In addition to my blog you might want to check my wife Peggy’s blog at http://www.travelswithquivera.blogspot.com where we feature our photos. We have just completed two and a half years of wandering and bought a house outside of Jacksonville, Oregon. We love it and would enjoy having you stop by on your journey. Also, where and when were you a Peace Corps Volunteer. Did you get any recipes out of Marshall? He loves to cook. Thanks for your kind comments. This is a wonderful resource Curt, thanks for making it available to me. I enjoy your writing and your photos, and Bone is the perfect host — kind of an Ambassador, wouldn’t you say? I’m sure I’m in good hands when I can sit down, chuckle at Bone’s latest “outfit,” manage a cleansing breathe and roll my neck while absorbing the relaxing graphics. Now, if only it had sound, ……… does it have sound? Particularly like that “and your…” Alice. Glad you are enjoying the blog. your blog is amazing have you seen mine yet. Hi thank you so much for the follow!! What a fantastic website, congratulations!! Regards, Dr Joseph S. Mambo General Medical Practitioner. Humanitarian Disp-Red Cross. Photos look awesome! What Digital Camera do you use? Thanks! Hi Chip, I use a Canon EOS Rebel XT with a Tamron 28-300 telephoto lens.I also work with photoshop. Glad you like the photos. Thanks. Curt – I wrote you some time ago letting you know I had the pleasure of meeting your brother Marshall. I suspect that you’re the only one that can get in touch with him and I’ve a question of him I wonder if you’d please pass on? Marshall told me of a great campsite near Okeechobee to go to, and said access could only be gained by applying at the upstairs office of some State of Florida department/agency located – I believe – in Okeechobee City. I want to follow up on his suggestion but as you can see, I need some specific guidance. Anything you can do would be appreciated. I met Marshall camping at Allapattah Flats and my name is Dave Williams. Thanks so much! Thank you Curt – I’ll give him a call. I guess now EVERY one in the world has a cell phone! Interesting and intelligent write. Enjoyed it very much. Thanks for stopping by Rosy. …and a belated congrats on Freshly Pressed! I am jealous… Have fun. Enjoy the beauty. And thanks for your comments. Hi Curt..I’ve nominated you for the Adventurous Blogger Award. If you like awards and want to accept this one, please see the details at: http://deetoursbydeepali.wordpress.com/2012/10/20/adventurous-blogger-me/. Thanks Curt for your blog on John Brown’s grave. I’ll most probably make this trek in the spring as well as a visit to Airds Moss to visit Richard Cameron’s grave. My ancestor was Alexander Peden’s brother. I’ve been to their birthplace, Auchencloich, and to many of the Peden’s Pulpits throughout the countryside. I greatly appreciate your detail in writing and I’ll sure keep my eye peeled for the ghost. Again, thank you! Sounds like you have done extensive research Mark. I hope to get back to Scotland again and do more. Beautiful country and friendly people. It was a fascinating time in Scotland when the Pedins, Browns and Camerons were living. Are you related to Henry Pedin, the Maryland genealogist? Thank you so much. I have always enjoyed writing and story telling… almost as much as I have enjoyed going out and having the experiences to write about. I will definitely check out the link. Thanks so much. Your visit to my blog led me to read your dog story. I too, tapped the follow button. Wow! I would love that experience. I’ve had monkeys crawling over me in the Amazon and Bali… but the mountain apes… that is wild! Thanks for directing me to your site. We stumbled over here comnig from a different web page and thought I might as well check things out. I like what I see so now i’m following you. Look forward to exploring your web page again. I appreciate you taking the time stop by my “netpub” …NETPUB translates to “BLOG” . I hate the word BLOG ! Blog sound so unsanitary. If you’re so disposed, you can find out more about “me” by reading my “ABOUT ME”. Thanks again. (I’m not sure if I’m posting this in the cocerrt place as I was unable to post it from the Dashboard. )The type of physician I would like to work with is a gerontologist. A gerontologist specializes in caring for the elderly. I have a fondness for our older population. They built out society and lived in a time that many of us can learn from. I would take great pride in caring for them as they age. In my opinion, working with a doctor that shares my passion and excitement would be the ideal work environment.The type of physician I would not be as excited to work with would be a proctologist. To be completely honest, I just don’t think I have what it takes to be in that environment. It’s important to be professional in any medical environment. I believe my sense of humor would not allow me to be as professional as I would need to be. I would also prefer not to work with ophthalmologist. Several years ago I spent a week with my grandfather at a specialist to have cataracts removed. I found it very difficult to watch the videos of my grandfather’s up coming procedures. It wasn’t difficult caring for my grandfather after surgery, but I must admit the pre-op was an experience that I would not want to assist in on a daily bases. Thanks for visiting our blog, and for the ‘like’ on the Laos post. There’s much more to come. We’re currently in Mexico staying put for a few months while I try madly to get the blog caught up to date (more on Laos, more on Thailand, and Myanmar, a truly extraordinary place). And because we really need a break 🙂 Not confident it will ever actually happen lol since as soon as I’m up to date we’ll be on the move again and there’ll be more – a never ending pleasure. Your blog is certainly a traveller’s cornucopia. People think we’re adventurous, but you two leave us in the dust! A pleasure to follow your adventures. Oregon coast sounds nice – hear you’re having a pretty nice spring up there. Hate that when the darn internet has a mind of its own! Thank You for visiting American Male hope you come back and visit soon! What a wonderful gift to give yourself the freedom to travel! I’ll be back… as Arnold likes to say. And yes, the freedom to travel is a wonderful gift. No better occupation than wandering! Hi Curt, I stumbled across your blogs when I was looking info on McClelland castle…McClelland being my mothers maiden name, this castle is our family history. Being the armchair traveller that I am I’m enjoying Peggy & your travels. Great stuff. Would you happen to have any faimly photo’s that were taken in Sterling that you would be willing to share? I live in Sterling and am interested in the history. Any photo’s that also include buildings are of interest.I remember your Aunt Francis and Uncle Dugan and Butch, they lived down the road from me when I was growing up. Hi Curt, you should pop over here http://animalcouriers.wordpress.com/2014/01/04/happy-new-year-everyone-and-giveaway-results/ – something awaits you! Ran into your name. Sounds like an enviable life! I’m glad to hear mention of Marshall. Granny (Star Marshall Colvig) told me he was impetuous and lacked judgment. Of course, when he visited us he was ten or eleven. How much judgment was he expected to have!? Contact me if you will. Marshall definitely marches to his own drummer. Now he is happily… and I am serious about the happy part, living as a homeless man with a van and a bank account, and migrating back and forth between Florida and North Carolina living in campgrounds. I visit with him when I wander that way and keep in touch with him via phone. I never thought I would end up in the land of our grandparents, great grandparents and great, great grandparents, but here I am. And it is a beautiful place to live. I stumbled upon your site via “A Holistic Wayfarer” and am so glad I did. I look forward to stopping by regularly. Hey there Curt! Just happened across your blog and decided to give you a follow. If you like, check out my blog at http://www.thatssojacob.wordpress.com. Have a great day! Curt, we love your blog, of course, because the two of you remind us of us! Loving travel, photography, and places to see. I’ve come upon two more posts on Sedona that I’d like to comment on (love them!) but not sure how. Am I overlooking a Comment offer at the end of your posts? Keep on posting. We love seeing where you go. We’re just writing to let you know we’re inviting you to the “Behind the Scenes Blog Hop” that’s been going around among a lot of great WordPress bloggers. It features bloggers answering four questions about what they write and how they write it. We see it as an online bloggers’ workshop. We’re always interested to hear how talented bloggers like you create your posts. You can find the questions on our post we’re publishing tomorrow (Thursday January 29) that will have a pingback to your blog. There’s no pressure to participate or even respond; it’s totally up to you. We’ve long admired your journey through life and enjoy reading the posts about your exploits. I have found your blog site to be wonderfully inspiring 🙂 I found it while looking for places to backpack with my two young daughters this summer (I’ve got my eyes on Red Butte, hence my discovery of your blog site,) and got lost in the fascinating rabbit hole of your adventurous life. I would love it if I could speak with you briefly, or exchange a few emails, to pick your brain about a concept I’m working on for the amateur adventurer. If you have time or capacity to speak with me, I’d be thrilled. I completely understand if you’re unable to for any reason; but if you’re available and willing, please email me. Warmest regards to you both, and happy adventures! When I saw your name twice in 5 minutes in the comment sections of two blogs I follow, I figured it was a sign I should check out your blog! I’m glad I did; we seem to like a lot of the same things in life. Happy trails! Great! I’m sure we will all enjoy some new vicarious adventures! Really enjoyed reading your blog posts, your photos are amazing. All the best! Hey there. My name is Chuck Gould and you have used a photograph of mine without my permission or knowledge and, further attributed the photo to Peter Coyote. He is a friend and old digger comrade of mine. The article was about Don McCoy et.al. Where did you obtain this photo of Paula McCoy that I shot in her home in SF in 1967? You need to contact me at:(email address provided) This is a copy write infringement and needs to be remedied. Sorry, Chuck. I will remove it immediately. Went back and checked to see if I could find where I found it Chuck. I did a lot of research on the Internet. But I couldn’t pin down the particular site. Just found this blog, very interesting. I was there at the bigfoot trap in 1975 with Ron Olsen. Took some photos of the trap and also the cabin and some other like small structures. I wonder if Ron Olsen is still living? Lived in Oregon in the 70’s and yes I was a Bigfoot hobbyist you might say! The story I heard was an old miner had lived there for several years and had some sightings is why they decided to put the trap there. And it wasn’t easy to get the permit from the Forest Service and they had to make a road to get the trap there. Hard to believe they exist now but what a fascinating story!!! First, thanks Teddy. Peggy and I enjoy sharing our adventures on WordPress. Glad you are enjoying them and like the new look. Hi Curt, wanted to comment on your latest post – the one with the seaside sculptures – but couldn’t find where. Is that just me not looking properly?